Calming, lush conservation areas, trails, and parks often form the backyard of Kortright Hills residents. Snuggled between the Speed River and Hanlon Parkway, Kortright Hills or Dovercliff Park has hidden surprises among its rolling hills of family homes. An open air movie night with the neighbours in Mollison Park makes for a cheery night. Try to keep it down though. The inukshuks in the nearby conservation area might be busy stargazing. At the crack of dawn, the city’s fiercest marathon runners turn the local bird sanctuary into dirt and grass training grounds, as the YMCA stirs back to life. Kortright West is academic by association to its neighbour, Old University. Pockets of UoG students in this largely older family area are daring and few. Its own little collection of indie and large chain shops is no longer a secret. 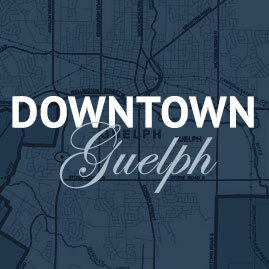 Neither is its off-leash dog park – the largest in Guelph – where canines prefer the fresh creek to their humans. Just as the young ones prefer the Kortright Splash Pad, and the not-so-young-ones, spotting a deer or two in the Preservation Park. In Kortright West, the road is gladly shared with the ducks, the deer and their friends and family. Remember to say hello on your next run. When you drive, go slow. Right across Gordon St., to the west of Westminster Woods, is its less populated counterpart- Clairfields or Hanlon Business Park. The iconic Sleeman breweries shining brightly among the pines are a strong reminder of Guelph’s locally significant businesses. The residential neighbourhood takes up only a corner at Gordon and Claire. The rest is Hanlon Creek Conservation Area loved by cyclists, runners and anti-leash dogs alike. Nick’s dragonfly playground is the community is favourite gathering spot. Southend’s only Starbucks seems to be gradually replacing the role of libraries. Ask the busy students there. The busy Gordon St corridor branches off in the east to perfectly manicured lawns, large homes, and winding streets. 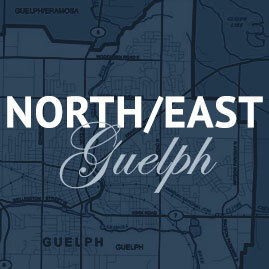 Welcome to one of the three centrally located neighbourhoods of Guelph, Kortright East. 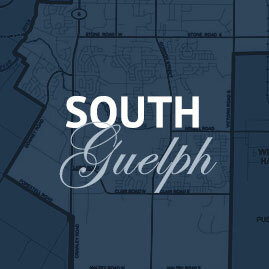 It is formed by the main veins of Guelph – Stone Rd. and Gordon St. in the northeast, and blocked off by Victoria Rd. and Arkell Rd. in the southwest. Hectic weeks see commuters ditch Gordon St. in favour of Victoria Rd. to get to 401. Precious weekends find residents in the Arboretum or the Victoria Road Golf Course, weather permitting. The area is seeing new housing and public spaces development. 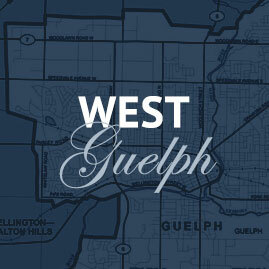 Westminster Woods and its next door neighbour Pineridge is Guelph’s shiney new neighbourhood. Built on New Urbanism principles – increased density, easy walkability, mixed housing, and quality architecture. Home to 9 to 5ers, big-city-jobs-small-family professionals, this neighbourhood is focused on convenience and modern aesthetics. Dream up a need and it’s right there. Groceries? Check. Banking? Check. Movies? LCBO? Starbucks, gym, trails, parks, new houses, high energy? Yep, all there. Still undergoing rapid development, it is home to youthful, diverse, on-the-go folks who embrace its proximity to highways to get out and get things done.